“Love, Marriage, Family” from Christian Faith Publishing author Kenneth D. Chastain is an engaging book that explains the purposes of the family and highlights the importance of growing up in a loving family in order to mold an individual to become productive participants in society. 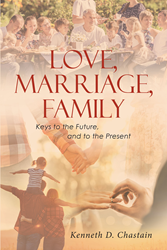 “Love, Marriage, Family”: a thought-provoking book about the important roles of the family and the factors that have influenced this unit of the society. “Love, Marriage, Family” is the creation of published author, Kenneth D. Chastain, a retired professor who is married to a lovely wife and is a father to three boys who have filled his life with joy. Chastain shares, “Throughout the history of mankind, the family has been one of the basic building blocks of society and therefore of all larger social organizations and ultimately of civilization. According to the Bible, God created the first man, Adam, out of the dust of the earth and put him in the Garden of Eden. Then, seeing that Adam was alone and that it was not good for him to be alone, God put Adam to sleep, took from him a rib, and created a help meet for him. Finally, he told Adam and his help meet to be fruitful and to multiply. Published by Christian Faith Publishing, Kenneth D. Chastain’s new book is an absorbing work about the concept of family that stresses its significance not only to the development of an individual, but also on the progress of society; a loving family is introduced as an important factor to assure the future of a child, a society, and a country. Parents are the ones who ensure the ideal growth of their children, and Chastain thoroughly explains this in his book. The respective roles of parents—including love and marriage—are also discussed. View a synopsis of “Love, Marriage, Family” on YouTube. Consumers can purchase “Love, Marriage, Family” at traditional brick & mortar bookstores, or online at Amazon.com, Apple iTunes store, or Barnes and Noble. For additional information or inquiries about “Love, Marriage, Family”, contact the Christian Faith Publishing media department at 866-554-0919.